With Apologies to Mick Jagger, Other Gods, and All Women, by Jane Rosenberg LaForge. Torrance, California: Aldrich Press, 2012. 72 pages. $14.00, paper. 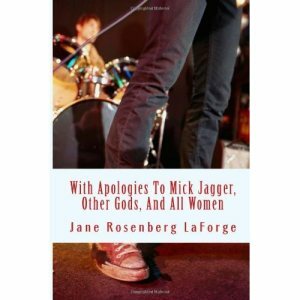 A quick look at the table of contents of Jane Rosenberg LaForge’s With Apologies to Mick Jagger, Other Gods and All Women reveals a miscellany of subjects: “The Famous Poet’s Moment,” “Hemingway’s Rot,” “Metaphor/Moth.” This is deceptive. This book is by and about a voice, a voice with a definite tone. There are a lot of things to say here, I could talk about the notion of Mick Jagger, other gods, and all women as distinct categories as suggested by the title or the sense of apology as both an admission of regret and as a justification explained. But what the books seems to focus on from beginning to end is the simultaneous construction and questioning of a specific voice. I have to admit I don’t really like this Voice. In my daily life I go out of my way to avoid it. If the book offered nothing other than a straight-forward illustration of The Poetic Voice I would not recommend it. Something else is going here, though. This is The Voice but it is consistently seeking to undermine its own authority and its ability to act. The primary action in these poems is that of watching. The speaker in “The Famous Poet’s Moments” stops counting “the poets, because I watched / one die because he was alone and could therefore / go on living”. This voice is that of a “spectator.” The poem mentioned in the title, “With Apologies to Mick Jagger,” ends with: “Just allow me / to calculate my own wreckage through mirrors and poetry, / and other fantasies of measurement.” The voice dismantled is the fantasy of fantasies—fantasy watching itself dismantling. And here is a way of dismantling: the phrase “as if.” “As if” appears in almost every poem in the book, sometimes more than once in a single poem. The declarative tone devolves into suggestion. The monumental gesture hesitates in proposition: “Not / the casting of light, but shadow, is what / I am worshipping…as if / make-up on features I cannot improve, / and no longer conceal” (“Two-Toned Muse”). This is The Poetic Voice surviving in spite of itself. The Voice becoming a voice, “deepened, but sheared of its depth” (“What Remains”). If nothing else, this is the voice of Walter Benjamin’s “angel of history” played out in witness of wreckage that is both public and private. There is no heavy-handed progress here to wisdom. What the spectator accumulates leads only to the voice of the spectator. My impatience with The Poetic Voice could have kept me from this book. I’m glad it didn’t. With Apologies to Mick Jagger, Other Gods, and All Women at Amazon.com! With Apologies to Mick Jagger, Other Gods, and All Women at Aldrich Press! You can find some of Nathan Moore‘s poems at Pudding Magazine, Everyday Genius, Menacing Hedge, and Fleeting Magazine. He posts paintings and other things here.